The patellofemoral joint is a complex articulation and alterations in its biomechanics can lead to abnormal load and pressure distribution on the articular surfaces resulting in cartilage breakdown, anterior knee pain and severe functional limitations . In addition malalignment predisposes to subluxation and dislocation . An understanding of the basic concepts underlying patellofemoral joint kinematics, acting forces and pressure distribution patterns is essential for the surgeon in order to appreciate the pathology and its progression and address it with appropriate surgical techniques. The patella is a sesamoid bone and its main function is acting like a lever arm thereby enhancing the efficiency of the extensor mechanism . The medial and lateral facets of the patella articulate with the femoral condyles. Between the femoral condyles is the trochlear groove. In addition there is often a third articulating facet on the medial patella ridge which comes in contact with the medial femoral condyle at 120 degrees of flexion . The flexion-extension pathway of the patellofemoral joint is a complex and dynamic cycle. At full extension there is no contact between the patellar articulating surfaces and the trochlear groove. Upon initiation of knee flexion, the inferior pole of the patella first comes into contact with the trochlea. Progression of flexion from 0 to 90 degrees leads to proximal migration of the contact point towards the central point. Beyond 90 degrees only the superior region of the patella is in contact with the distal aspect of the trochlear groove . After 120 degrees of flexion only the medial and lateral aspects of the patella come into contact with the femoral condyles . The contact surface area steadily increases with increasing flexion to 60 degrees and thereafter there is wide variability as a result of variation in individual anatomy . It is at low degrees of flexion that the knee is least stable to lateral patellar movement . The majority of patellar motion throughout knee flexion is in the sagittal plane. The forces acting on the joint surfaces vary throughout the cycle. In early flexion there is a small compressive force vector which increases as flexion increases. The three major forces acting on the patella are the pull of the quadriceps, the patella tendon tension and the joint reactive force of the patellofemoral joint. The forces acting on the patella have been estimated as 1.5 times body weight at 30 degrees of flexion to 6 times body weight at 90 degrees of flexion [7, 9]. The articular cartilage of the patella is the thickest in the human body and this reflects the great pressures applied throughout the patellofemoral joint during knee flexion . Management of patellofemoral joint pathology is challenging as a result of the unique and complex organisation of static forces (ligamentous and osseous elements) and dynamic factors (neuromuscular) that contribute equally to its functional capacity . Bony architecture and soft tissue balance are equally important. The quadriceps and the patellar tendon have a balanced, blended insertion and origin on the patella and generate the majority of acting forces on the patellofemoral joint. The patella is not a simple lever arm but a changing fulcrum position for the quadriceps force. The medial and lateral patello-femoral and patello-tibial complexes form the main soft tissue static stabilisers of the joint . Patello-femoral function is also dependent on limb alignment, which includes varus or valgus tibio-femoral alignment as well as rotational variances. Anterior knee pain is a common musculoskeletal complaint seen daily in the practices of primary care physicians, rheumatologists, and orthopedic surgeons. It has been reported to affect as many as one in four individuals in the general population  In the past, the term “chondromalacia” was misused inter- changeably with anterior knee pain or patellofemoral pain syndrome. The implication that cartilage is the primary source of symptoms is incorrect as the majority of patients presenting with anterior knee pain do not have cartilage defects and cartilage is aneural . The prevalence of patellofemoral cartilage defects is controversial, as it is unknown what percentage of lesions become symptomatic enough to prompt evaluation. The key to successful treatment of patients with anterior knee pain lies not only in the correct diagnosis of a chondral defect, but more importantly, in the accurate identification of associated pathomechanical factors, such as patella alta, trochlea dysplasia, increased lateral position of the tibial tubercle to the femoral sulcus (previously assessed as a “Q” angle), and secondary soft-tissue problems, such as a weakened or hypoplastic vastus medialis muscle with a contracted lateral retinaculum. These pathomechanics lead to abnormal forces of the patellofemoral joint, which can cause injury to the articular cartilage in itself through repetitive micro- trauma or exacerbate the effects of a traumatic event. The same factors contribute to patellar instability a generic term for patellar dislocation, patellar subluxation (incomplete dislocation) or when patients complain that their patella feels like it will 'pop' out of joint. Careful evaluation of symptoms, clinical examination and imaging modalities all have a role in assisting the process of diagnosis. Detailed discussion of these is beyond the scope of this article. It is however important to briefly outline some findings that would indicate patellofemoral maltracking as the source of pathology. Physical examination of the patellofemoral joint requires both static and dynamic assessment. It consists of three parts in the standing, sitting and supine positions. Axial alignment of the lower limbs should be evaluated in the standing position as abnormalities will alter the PFJ biomechanics. Abnormalities of the pelvic geometry, femoral anteversion as indicated by an inward pointing or “squinting” patella, knee abnormalities such as genu varum or valgum as well as limb length discrepancies should be assessed at this stage. Any of these abnormalities can affect the Q angle. Most commonly an increased Q angle will lead to an increased valgus force on the patella . Abnormalities of gait may be secondary to antalgia at the PFJ or be the cause of abnormal pathomechanics. In the siting part of the examination thigh muscle girth should be evaluated. Often atrophy of the vastus medialis muscles contribute to patella maltracking. The anatomical position of the patella should be carefully observed. Patella Alta could contribute to patellofemoral disorder and instability and if suspected should be radiographically assessed using the Insall-Salvati ratio. Radiographic evaluation can also indicate other potential causes of pathology such as trochlear dysplasia. A high tibial tuberosity trochlear groove (TTTG) ratio should be considered as a potential cause of maltracking. Rotational malalignment should also be evaluated at this stage. The final part of the examination in the supine position will also assist in the evaluation of static and dynamic factors affecting the functional capacity of the joint. A visual inspection of the flexion-extension cycle will alert to abnormalities of patella tracking. Lateral subluxation of the patella in terminal extension is known as the J sign. Although the true anatomic correlation of this phenomenon is unclear Johnson et al. showed that this is a finding that is unique to patients with abnormal patella tracking. The extensor mechanism can also be assessed by the active quadriceps pull test. The medial and lateral patella retinaculae can be assessed by the passive patellar glide test and the passive patellar tilt tests respectively . An attempt to elicit the patellar apprehension sign of Fairbank should also be performed at this stage. Physical examination can therefore provide invaluable clues as to the presence of patellofemoral maltracking and determine the need for further evaluation and management. Haim et al. conducted a clinical trial to assess the sensitivity and specificity of key patellofemoral physical examination tests and evaluated the prevalence of examination and radiographic findings. Only the patellar tilt test and active instability test were positive in a significantly greater proportion of patients with patellofemoral pain syndrome and they demonstrated that physical examination findings were more usefull than radiographs. Smith et al. conducted a systematic review suggesting considerable disagreement on the reliability and validity of clinical Q angle measurements. Davies et al. have studied 137 knees in order to identify a rapid and reproducible radiological feature which would indicate the need for further analysis and argued that the sulcus angle is an easily and rapidly measurable feature which was reproducible and was closely related to other features of dysplasia of the extensor mechanism. Non operative management has traditionally been the initial approach to patellofemoral pathology and in appropriately selected groups the results have been satisfactory [10 ] Local and systemic analgesics can help with symptom control. Heintjes et al. performed a systematic review and concluded that there is limited evidence for the effectiveness of NSAIDs for short term pain reduction in PFPS. The evidence for the effect of glycosaminoglycan polysulphate is conflicting and merits further investigation. The anabolic steroid nandrolone may be effective, but is too controversial for treatment of PFPS. Physical therapy has focused on local muscle control and joint function but recently there has been a shift towards limb control and body positioning to reduce the abnormal loads generated. Water based therapy has been regarded as effective in further reducing these loads. In a Cochrane systematic review  the evidence that exercise therapy is more effective in treating PFPS than no exercise was limited with respect to pain reduction, and conflicting with respect to functional improvement. There is strong evidence that open and closed kinetic chain exercises are equally effective. Further research to substantiate the efficacy of exercise treatment compared to a non-exercising control group is needed, and thorough consideration should be given to methodological aspects of study design and reporting A variety of equipment such as tapes and braces have been designed to assist with control and limit maltracking and despite the limited clinical data to support their effectiveness, the ease of application and lack of side effects has made them quite popular. In the context of this article however we will discuss about the operative management of patellofemoral malalignment; the indications for surgery, the different techniques available and the evidence regarding their effectiveness. Patellofemoral disease is one of the most controversial management issues in orthopedic surgery. Despite the complexity of the interplay of various components it is essential to attempt to describe patellar malalignement as a clinical entity in order to proceed with appropriate surgical management  and successful outcomes. Post et al. eloquently described malalignement as “ [a] malalignement of forces ... a concept of imbalance that helps explain patellofemoral disorders ... Treatment of malalignement must include consideration of all contributing forces.” Appreciating the pathoanatomic basis of the disease and addressing imbalances and anatomical abnormalities should guide treatment. Fulkerson  contributed significantly by providing a concise classification scheme based on imaging modalities that allows for different presentations of the maltracking spectrum to be categorized and interventions to be targeted accordingly. Dejour et al. in 1987 established a classification of patellofemoral disorders and described 4 major instability factors with a statistical threshold and 4 minor instability factors with no statistical threshold that should be addressed for successful treatment (Fig. 1). The goals of patellofemoral re- alignment surgery should be to create both a stable environment for optimal extensor mechanism performance and an appropriate load transmission for optimal cartilage wear and joint loading. Anatomic factors for objective patellar instability. There is confusion as to whether surgical procedures or conservative management provides the optimal result in functional outcome and quality of life for participants following patellar dislocation . In current practice indications for surgery after acute dislocation are failure to improve with nonoperative care, osteochondral injury at time of dislocation, continued gross instability, injury to the MPFL-VMO mechanism, and high level athletes that suffered a nontraumatic dislocation . The aim of surgery is to address the factors contributing to instability and therefore reduce the potential for recurrent dislocation which may substantially limit a patient's functional capabilities and quality of life . The patella can be stabilized in a more medial (to the inside) position through interventions such as medial augmentation or reefing, lateral release, Roux-Goldthwaite procedures and tibial tubercle transfers . MPFL reconstruction following rupture is also employed to regain some passive constraint to abnormal lateral translation (outward movement) of the patella . A trocheoplasty may be indicated in cases where there is an insufficient groove or femoral trochlear for the patella to move within due to trochlear dysplasia . Even by 1966 more than 100 procedures had been described for the treatment of patellar instability . The effects of patellofemoral malalignement on abnormal load bearing of the PFJ and subsequent cartilage wear have been well established in the literature. In a series of 72 knees managed with patellofemoral arthroplasty 85% required a re-alignment procedure at the time of arthroplasty . The most prevalent area of chondral disease on the patella is on the lateral facet . This is due to the fact that the lateral facet becomes overloaded more commonly than the medial side and suggests that some degree of patella tilt or malalignment is more common than we realize. The importance of concomitant re- alignment is demonstrated in early reports on patellofemoral autologous chondrocyte implantation as good outcomes were reported in only 30% of patients without corrective osteotomy . Hay et al. reported a significantly greater incidence of lateral patellar subluxation post TKR with a medial approach compared with lateral approach group with tibial tubercle osteotomy . Realignment procedures alone have demonstrated encouraging clinical outcomes with careful patient selection and in cases of patellar maltracking associated with chondral defects of the inferior and lateral patella. The experience with treatment of other defect locations by realignment alone, however, has been less satisfactory . Malalignement has been reported as a primary failure mode following patellofemoral arthroplasty . Objective patellar instability: Patients presenting with this pattern will have a history of at least one true dislocation of the patella (permanent loss of contact between 2 joint surfaces), and at least one anatomic abnormality. Potential patellar instability: Patients in this group will not have had any true patellar dislocation, but will have pain and anatomic abnormalities. Painful patella syndrome: These patients will have neither dislocation nor anatomic abnormalities; however, they will have pain. He advocated surgery for recurrent dislocations in group 1 and claimed that painful patellar syndrome is not an indication for surgery. His proposals have been contested by advances in our understanding of the multifactorial pathology and by the constant evolution of intervention techniques. Proximal realignment surgery involving the soft-tissue structures of the knee is performed to either tighten the medial side (medial reefing, VMO advancement, MPFL repair or reconstruction) or loosen the lateral side (lateral release). These procedures can be performed open or arthroscopically. This procedure has been widely utilized in clinical practice since first described by Merchant and Mercer in 1974 . It was not until 1999 when Post  outlined the key physical examination findings that needed to be determined for the evaluation of clinical instability, in order for appropriate management decisions to be established. The lateral retinacular release was initially indiscriminately used for anterior knee pain, patella instability, and also as a treatment for osteoarthritis of the patellofemoral joint. Ficat  introduced the concept of the “excessive lateral pressure syndrome” which helped to redefine the indication for this procedure. It has now been recognized that this condition is an acceptable indication for an isolated LRR that yields reproducible and predictably good results . The absence of published randomized controlled trials (Level 1 evidence) on the topic makes it impossible to conduct a formal systematic review as the majority of available material consists of level 4 evidence (retrospective case series, review articles). Table 1 is an overview of the published case series when isolated lateral release is utilized to address patellar instability . Despite initial reports of acceptable success rates, most studies demonstrate disappointing mid and long term results. When assessing its effectiveness in the treatment of recurrent dislocations Aglietti et al. showed that isolated lateral release has poor outcomes and is associated with high recurrence rates. Danier et al. concluded that in the context of dislocation an isolated lateral release is as effective as a diagnostic arthroscopy. Henry  demonstrated significantly inferior outcomes when compared to open patellofemoral reconstruction in the management of patellofemoral subluxation. Gerbino et al. have demonstrated satisfactory outcomes on a long term follow up study of adolescents who underwent LRR (minimum 5 year follow up) but instability patients were shown to have significantly higher re-operation rates than tilt patients. Aderinto and Cobb  in a retrospective study suggested that arthroscopic lateral release is effective in reducing the pain of symptomatic patellofemoral osteoarthritis and gives reasonable rates of patient satisfaction irrespective of the presence of tibiofemoral arthritis. The evidence suggests therefore that the isolated use of a lateral retinacular release of the patella has not proven to be of long-term benefit for the treatment of patellar instability. Richetti et al. have conducted a level III systematic review of the available literature to compare surgical success of lateral retinacular release with or without medial soft tissue realignment for recurrent lateral patellar instability . They demonstrated that isolated lateral release yields significantly inferior long term results with respect to symptoms of recurrence. The procedure should be reserved for the few patients with a clearly identified lateral patella compression syndrome in presence of a tight lateral retinaculum (decreased lateral patellar tilt) following failure of six months of physical therapy [39,46-49]. Pagenstert et al. conducted a level II prospective double blinded comparative study demonstrating better clinical outcomes when retinacular lengthening procedures were employed instead of LRR in the treatment of lateral patellar hypercompression syndrome. As a result of the absence of strong evidence to suggest favourable outcomes, even among experienced knee surgeons with a special interest in diseases of the patellofemoral articulation, isolated LRR is rarely performed nowadays . Various authors have suggested that a lateral release procedure may be added as an adjunct to a proximal or distal patellofemoral realignment procedures [38,52,53]. In these cases the release has to be done judiciously and has to be gauged by the desired effect. Various authors [54,55] have demonstrated that LRR can also be a useful adjunct to medial retinacular augmentation procedures. Wu  has also suggested that in the elderly population who are not fit for arthroplasty, a combined LRR with drilling chondroplasty is a feasible alternative for the treatment of patellofemoral osteoarthritis with acceptable clinical outcomes. Despite the procedure often been regarded as simple and forgiving, the most imminent danger and complication of an isolated lateral release is the overzealous or nonindicated release leading to medial patella instability [57-59]. Hayworth et al. have examined the use of open lateral retinacular closure in patients who develop anterior knee pain and positive medial patellar apprehension test post LRR. They have shown that this novel but simple procedure can provide significant pain relief and improvement in functional scores. Similarly Teitge et al. have suggested that reconstruction of the lateral patellofemoral ligament is useful in eliminating the symptoms related to medial instability of the patella after failed lateral retinacular release; however, it must be considered a salvage procedure because it does not address the pathomechanics that led to the initial patellofemoral symptoms. There are also concerns that the retinaculum should not be released past the proximal pole of the patella to avoid detachment of the vastus lateralis obliquus with resultant weakening of the quadriceps mechanism. However results produced by Woods et al. argue against this. In the presence of severe medial patellar articular lesions a LRR may increase the load to the defect which may be detrimental. Pawar et al. have recently raised awareness by documenting the great incidence of transient patellar hypovascularity associated with lateral release on a prospective study of knees undergoing total knee replacement with lateral retinacular release. In a prospective, randomized outcome study O’Neill  compared open with arthroscopic lateral release. With a mean duration of follow up of forty six months they did not demonstrate any statistically significant difference in functional scores, deficits in the range of motion, atrophy (the circumference) of the thigh, operative or postoperative complications, or the need for subsequent operative procedures. Additionally, no significant difference could be detected between the groups with regard to the results of open or closed-chain testing with an isokinetic dynamo-meter. The only significant difference was demonstrated in scores on the knee-rating system of Lysholm and Gillquist as modified by Tegner and Lysholm where higher percentages of patients undergoing open release scored 80 points or more. The author has suggested that the current trend towards arthroscopic procedures is not supported by evidence in the literature. Lattermann et al. performed a systematic review of the literature available and found no statistically significant differences between the open and arthroscopic groups. Only one of the ten studies included was a randomized clinical trial. The recent literature does not support the use of an isolated lateral release for the treatment of patellar instability. There is a role for LRR as an adjunct in proximal and distal realignment procedures. In the context of lateral patellar hypercompression syndrome, LRR still has a potential role despite the recent advent of novel procedures such as retinacular lengthening. LRR is still a useful adjunct in various procedures addressing patellofemoral osteoarthritis with good outcomes in appropriately selected population. Restoration of normal anatomy is essential in addressing patellofemoral maltracking. Reconstruction of the medial stabilizers has a key role either as an adjunct to distal realignment procedures (in patients with abnormal throchlea sulcus - tibial tubercle angles) or as an isolated procedure particularly in the context of recurrent patella dislocators who have failed conservative management. MPFL laxity as a clinical and investigative finding should be established for the procedure to be appropriate . Various techniques and approaches have been described, including primary repair with or without augmentation, and reconstruction using autogenous tendon, allografts, and synthetic graft materials. These procedures share the common objective of addressing the essential lesion in lateral patellar instability to restore the normal passive restraints against lateral patellar displacement. The medial patellofemoral ligament (MPFL) has been recognized as the most important medial structure in maintaining normal patellofemoral tracking throughout knee flexion . As flexion increases from 20 to 30 degrees the lateral facet of the patella comes into contact with the medial aspect of the lateral femoral condyle. This serves as a bony buttress preventing excessive lateral translation. Flattened, dysplastic femoral condyles are commonly encountered and this anatomic variation can result in patellofemoral maltracking and instability. Soft tissue stabilisers include the MPFL, the medial patellomeniscal ligament, the medial patellotibial ligament, the medial retinaculum and the lateral retinaculum . The MPFL is the most important of these structures in maintaining patellofemoral stability and has been shown to contribute over 50% of the forces preventing lateral displacement of the distal knee extensor mechanism . MPFL rupture has been shown to occur at 26mm and since patellar dislocation generally requires 50mm of displacement, the MPFL must tear . Following a patellar dislocation, tears of varying degrees to the MPFL have been shown to exist in 94% of patients . Various surgical techniques have been described to repair or reconstruct this structure in patients with patellofemoral instability. Medial soft tissue reconstruction procedures have a crucial role in restoring normal soft tissue anatomy and improving outcomes. Many reconstructive procedures have been described to address insufficiency of the medial soft tissue. These have ranged from distal realignment procedures  lateral release and repair, imbrication, or reconstruction of the medial structures [82-86]. Various techniques for reconstructions of the MPFL with semitendinosus , gracilis , quadriceps tendon  and even synthetic grafts  have all been described. No clear data have been presented demonstrating the superiority of one surgical technique over another . Isolated lateral releases in the context of treatment of patellofemoral instability have demonstrated poor long term results [39,42] and the use of medial soft tissue reconstruction techniques as an adjunct has been shown to improve positive outcomes [45,55,54]. Trochleoplasty has been advocated as a procedure to address instability secondary to trochlear dysplasia with fairly good outcomes [28, 92] but the use of medial soft tissue reconstruction procedures has demonstrated superior results in this population group . In cadavers with normal lower limb alignment (normal Q angles) MPFL reconstruction reduced lateral patellar subluxation to a greater extent than tibial tubercle medialisation procedures . In a long term follow up study on their series of MPFL reconstructions using transferred semitendinosus tendon Deie et al. reported significant improvement in outcome scores and no dislocations at 5 years. Fernandez et al. reported similar outcomes at mean follow up of 38 months. Nomura et al. reported 66% excellent results with an average follow up of 4.2 years and no cases of recurrent dislocations or apprehension. Their reconstruction was augmented with repair of remnant MPFL. Other authors have reported on their series demonstrating no cases of re dislocations or apprehension at follow up intervals varying from 31.5 months  to 38 months . Schottle et al. presented a series of 15 knees with MPFL reconstruction using semitendinosus autograft with a mean follow-up of 47 months. They had significant improvement in Kujala's scores (55.0 to 85.7), 2 redislocations (bilateral in same patient), 3 knees with residual apprehension, and 2 knees with patella baja. Gomes et al. reported on MPFL reconstruction performed on 16 knees using semitendinosus autograft with a follow-up of at least 5 years. In their series, they had no re dislocations and 1 knee had patellar apprehension. There were 11 excellent results, 4 good, and 1 poor. Using Fulkerson’s functional knee score, Drez et al. , have demonstrated 93% overall improvement in their series. Proximal soft tissue realignment procedures have evolved in recent years to include minimally invasive techniques in order to avoid the significant morbidity associated with major surgery. Xu et al. have recently described a minimally invasive medial imbrication procedure using an all inside arthroscopic technique and two epidural needles without any accessory portals. Using lateral release procedures as an adjunct they have reported on improved patellofemoral tracking. Advancement of the MPFL has been advocated as an alternative to reconstruction techniques associated with good outcomes and reduced morbidity . Satterfield et al. have described an arthroscopic patellar “Bankart” repair after acute dislocation. Yan et al. reported statistically significant improvements and no recurrences at 19 months follow up in their series of adolescent patients. They used an arthroscopic reconstruction technique utilising trabs of medial soft tissues (medial patellar retinaculum, joint capsule and vastus medialis oblique muscle fiber) to avoid morbidity at the donor sites for previously described grafts. Zhao et al. conducted a randomised controlled trial (level II evidence) and concluded that arthroscopic medial retinaculum plication (MRP) is less reliable for maintaining the corrected position of the patella and for functional recovery compared with vastus medialis plasty for recurrent patellar dislocation in adolescents. In their series with an average follow up of 4.7 years Xu et al. concluded that arthroscopic MRP is not reliable for maintaining the corrected position of the patella for recurrent patellar dislocation in adolescents, though functional improvements are significant. Wang et al. reported that the combination of MPFL reconstruction with vastus medialis advancement is better than isolated reconstruction to improve the subjective effects and decrease the patellar instability rate for chronic patellar dislocation. Krause et al. have produced medium term results following vastus medialis obliquus plasty demonstrating below average re-dislocation rates and reduced rates of retropatellar arthrosis as well as allowing a greater degree of adaptation. Zeichen et al. have produced interim results on their large series of patients treated with by Insall proximal reconstruction (vastus medialis transfer and lateral release). Their results show good clinical results for the treatment of acute patellar dislocation in young, active patients. The recurrence rate of patellar dislocation can be reduced and subjective satisfaction with this procedure is rated very well. Various new techniques for graft harvesting, positioning and attachment have recently been described in an attempt to improve outcome measures and reduce morbidity . The majority, however consist of level III-V evidence from reported series and their outcomes are inconsistent. In a systematic review of 21 studies addressing MPFL reconstruction Fisher et al. have recently recommended the need for improved outcome measurements to determine the efficacy of these procedures. In a systematic review of the available literature, Smith et al. identified 8 papers collectively assessing 186 MPFL reconstructions. Following critical appraisal of the papers a number of methodological weakness where identified. Authors recommended future studies should address these methodological flaws to begin to assess the effectiveness of this procedure. There is yet no sufficient evidence available for a clear consensus as to the best method for proximal soft tissue realignment. Distal realignment procedures consist of tibial tubercle transfers with the patellar tendon to improve tracking of the patella. Roux in 1888 was the first to introduce the concept of distal realignment by means of tibial tubercle transfer. In recent decades various modifications of the procedure have been described by authors like Elmsie and Trillat , Maquet  and Fulkerson . These procedures are primarily indicated in patients with patellar subluxation, increased Q angles and abscence of hyperlaxity. Fulkerson et al. have pointed out that less than 2% of patients with patellofemoral pain require a tibial tubercle transfer. As noted by Morshuis et al. , distal realignment procedures result in satisfactory results in about 2/3 patients who have patellofemoral pain and x-ray evidence of arthrosis but nearly all patients w/ patellofemoral pain w/o x-ray evidence of arthrosis had good or excellent results. The majority of distal realignment procedures are nowadays performed together with proximal realignment to address the complex factors contributing to maltracking and instability. In a review the evaluation and management of patellofemoral instability Boden et al. [ 113] commented that although no ideal treatment exists for patellofemoral arthritis, mechanical symptoms may be alleviated by arthroscopic debridement of lesions. Articular cartilage-wear disorders may be stabilized by addressing the primary causative disorder by means of realignment procedures. In 1938 Hauser  a technique for medialising the tibia tubercle to decrease the Q angle. The concurrent posterior tranlsation resulted in an increase in patellofemoral contact forces and the procedure had unfavorable outcomes. The Maquet procedure  aimed at addressing this by means of anterior translation relying on principles derived from biomechanic studies indicating that it should reduce the patellofemoral stress levels. The results have not been shown to be superior to medialisation procedures . The rates of failure in long term follow up studies have caused many modifications in this procedure . The Elmslie-Trillat procedure involves lateral retinacular release, medial capsular reefing, and medial transposition of the anterior tibial tubercle hinged on a distal periosteal attachment. It is an easily performed procedure and is an excellent method for realignment of the extensor mechanism in cases of dislocation and subluxation of the patella. The procedure has been used since the early 70s with favorable outcomes reported . There have been many modifications over the course of the last 40 years in attempts to improve outcomes and address patellofemoral pain secondary to instability and maltracking. Endres et al. conducted a retrospective study of 18 patients with a follow up time of 10 years and recently presented their results. They recommended the procedure in cases presenting with an increased q-angle, trochlea dysplasia or failed soft tissue surgery. In their study the majority of patients reported a return to previous sporting activity ten years after surgery and there was only one case of persistent instability. Nakajima et al. have recommended the use of the procedure, in combination with lateral release as a useful surgical treatment that can eliminate patellar subluxation after TKA in cases with component malposition. Whiteside  has described a series of 31 knees undergoing total knee arthroplasty requiring distal realignment procedures to correct lateral patellar subluxation that could not be corrected by lateral release or VMO advancement. The results reported were satisfactory with low complication rates. In their retrospective study, Dannawi et al. evaluated the use of the Elmslie Trillat procedure in patients with recurrent patellar dislocation, patellofemoral pain due to maltracking or both. They concluded that the procedure s a good surgical option for treatment of recurrent patella instability following failed conservative therapy. However, the results are not as favorable for patients with patellofemoral pain without instability. Similarly Kumar et al. have demonstrated more favorable outcomes in patients whose primary symptom was dislocation rather than pain. In a study to evaluate mid- and long-term results of the modified Elmslie-Trillat a swell as factors affecting outcome, Karataglis et al. analysed their results and revealed a better functional outcome when the operation was performed for patellar instability, as well as in the absence of grade 3 or 4 chondral changes in the patellofemoral joint at the time of operation. The authors have suggested that the Elmslie-Trillat procedure satisfactorily restores patellofemoral stability and offers a very good functional outcome, especially in the absence of significant chondral changes in the patellofemoral joint at the time of operation. Their findings are in agreement with previous reports by Naranja et al. who demonstrated more favourable long term functional outcomes in young patients without evidence of progressive osteoarthrosis and with patella instability as a primary symptom. In a 28 year follow up study, Carney et al. demonstrated that the prevalence of recurrent subluxation and dislocation in patients with patellofemoral malalignment who underwent the Roux-Elmslie-Trillat procedure for dislocation or subluxation of the patella is similar at 3 and 26 years after the procedure. The long-term functional status of the affected knee in patients who underwent the Roux-Elmslie-Trillat procedure declined. Similarly Nakagawa et al. demonstrated a deterioration of long-term clinical results after the Elmslie-Trillat procedure for dislocation of the patella as a result of the onset or worsening of patellofemoral joint pain, not patellar instability. In a case series of 35 knees with average follow up 98 months, Barber et al. concluded that the Elmslie-Trillat procedure is successful in eliminating recurrent instability in patients failing conservative management. Rillman et al. have proposed a Fulkerson's modified Elmslie-Trillat procedure for objective patellar instability and patellofemoral pain syndrome. Based on their results authors have concluded that the operation is an excellent treatment method with a very low morbidity for patients with patellofemoral malalignment after failed conservative treatment. Palmer et al. have proposed a surgical procedure consisting of a lateral release, a VMO advancement and a tibial tubercle transfer tailored to each patient in an attempt to correct all the abnormalities of patellofemoral maltracking. At mean follow up of 5.6 years they demonstrated good to excellent results in the majority of cases with low complication rates. The Fulkerson osteotomy is an anteromedial tibial tubercle transfer advocated in the treatment of chronic patellofemoral malalignment with severe articular degeneration (Outerbridge type III-IV) particularly in the lateral and distal regions of the patella . Karamehmetoglou et al. have reported on a series of 21 such cases treated with Fulkerson osteotomies. The results using fulkerson’s criteria and pain and instability scores showed significant improvement. Anteromedial tubercle transfers have been advocated as appropriate surgical management in patients with patellofemoral arthrosis with severe maltracking whereas medialisation alone has been recommended for cases of mild to moderate maltracking . Price et al. advocated that the Fulkerson procedure appears to be an excellent treatment option in patients with a chronically dislocated patella component after total knee arthroplasty. The goals of a corrective osteotomy of the tibial tubercle are to normalize the TT-TG distance and thus transfer stress from areas of chondrosis to areas of intact cartilage, and increase patellofemoral contact area by improving congruity, thereby decreasing contact stress. Several variations of tibial tu-bercle osteotomy have been developed over the years. The Fulkerson anteromedialization tibial tubercle osteotomy has gained popularity in the United States as a modification of the Elmslie-Trillat procedure in that it allows a more aggressive anterior translation than the latter . A study  used cadaveric human knees to compare the effects of medializing and anteromedializing the tibial tubercle during procedures to correct patellar instability in adults. Their results demonstrated that both procedures improved abnormal contact pressures and patella maltracking. Medialization improved the shift of force to the lateral facet created by an increased Q-angle, however, whereas anteromedialization did not. Due to the higher morbidity associated with distal realignment procedures; Lim et al. have proposed a management algorithm for clinical practice. They conducted a prospective cohort study of 23 patients and concluded that patients with significant patellar maltracking following traumatic patellar dislocation would benefit from distal realignment using the Elmslie-Trillat or Roux Goldthwaite procedure. Otherwise, a proximal soft tissue procedure involving MPFL reconstruction would be adequate. Koeter et al. have recently described a modified tibial tubercle osteotomy for patellar maltracking and their results at two year follow up. They performed a subtle transfer of the tibial tuberosity according to the information gained from the pre-operative CT scan. According to their results if carefully performed, this type of transfer of the tibial tubercle appears to be a satisfactory technique for the treatment of patients with an increased tibial tubercle-trochlear groove distance and who present with symptoms related to lateral maltracking of the patella. Marcacci et al. performed a modified version of the Elmslie-Trillat procedure in patients who demonstrated continued dynamic instability of the patella after tibial tuberosity transfer. The modification was the use of the medial third of the patellar tendon to help further stabilize the patella. At 5 year follow excellent results have been shown with no reports of recurrent dislocations. Dicks et al. performed a study comparing the outcomes of patients with a maltracking patella versus patients with a subluxation/dislocation history and anatomical abnormalities undergoing computed tomography (CT)-guided tuberosity transfer. Based on the results patients with a lateral tracking patella were 2.6 times more likely to have an improvement in pain after surgery compared to patients with a history of dislocation. The authors advise separating patients with a maltracking patella as the cause of their generalized patellofemoral pain since surgical treatment appears to improve their symptoms. Distalisation of the tubercle has been described as a beneficial procedure for treating patients with painful patella alta . Corection of the Caton-Deschamps index along with significant improvements in stability have been demonstrated by distal translation of the tubercle in 61 knees with patellofemoral maltracking and patella alta . Neyret et al. have described an adjuvant procedure to distal tubercle transfers aimed at reducing the patellar tendon length in patients with length greater than 52mm. The available literature suggests that distal realignment procedures and their modifications have an important role to play in the management of patellofemoral instability and maltracking. They address biomechanical alterations by affecting the Q angles and correcting the tibial tuberosity-trochlear groove values. Progressive retropatellar arthrosis is often seen in dated rigid distal realignment (i.e. osteotomy of tuberosities) at long-term follow-ups. Therefore, operations for lateral dislocation of the patella are still discussed controversially. Dynamic, proximal realignments seem to have lower rates of arthrosis but higher rates of re-dislocation. The need for precise definition of the underlying pathology and the establishment of management protocols with defined indications for each procedure still remains an issue. The reports available consist primarily of case series and cohort studies as well as biomechanical studies lacking strong evidence. The instability caused by a dysplastic lateral femoral condyle has been addressed by many different procedures and surgical techniques have been described as early as 1915. Aylbee  described a lateral-facet elevating trochleoplasty, elevating the lateral femoral facet to block the tendency of the patella to dislocate. Masse  was the first to introduce the procedure of sulcus deepening trochleoplasty in 1978. It is designed to abolish the prominence of the trochlear sulcus and to establish a groove of correct depth. The procedure was modified by Dejour  in 1987 when he defined and classified trochlear dysplasia and determined the indications for the procedure (Fig. 2). His classification has proven to be valid, reliable and reproducible . 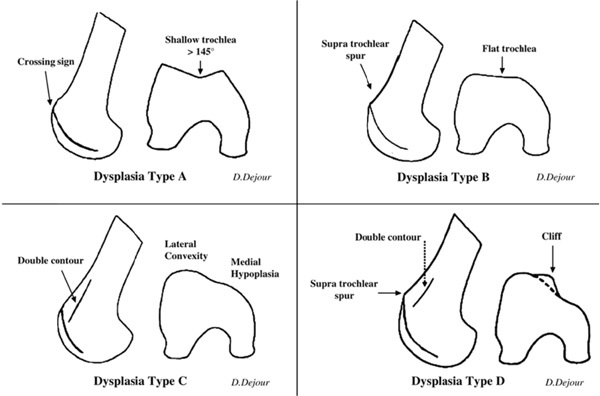 Trochlear dysplasia classifications by Dejour. Von Knogh et al. have conducted a retrospective study of 45 knees with a mean follow up of 8.3 years. The authors concluded that the procedure treated the recurrent dislocation, but its effects on pain and degenerative changes were unpredictable. Donnell et al. have reported on their series of patients undergoing a modified Dejour trochleoplasty and have commented that trochleoplasty for severe dysplasia of the femoral sulcus is a developing procedure. It requires careful attention to detail. For a rare condition their early results have been satisfactory with an acceptable level of complications. Thaunat et al. have recommended the use of recession wedge trochleoplasty as an additional procedure in the surgical treatment of patellar instability with major trochlear dysplasia. Their early results in a series of 19 knees have been encouraging. In comparison to other surgical procedures stabilizing the patellofemoral joint, trochleoplasty is a major operation with an arthrotomy, and associated typical risks of open surgery such as arthrofibrosis. Blond and Schottle  have recently proposed an arthroscopic approach to reduce morbidity and improve postoperative management. They have not yet reported on their series. In a systematic review of the literature, Smith and Leigh  in 2007, identified and reviewed six clinical papers and concluded that trochleoplasty is a safe and effective procedure in patellar instability due to trochlear dysplasia. They commented however on the methodological limitations of the current evidence base as the major limitation of their review conclusions. Although results seem very good in terms of instability, further evidence is still needed since the groups of patients in the published series are heterogeneous . Trochlear dysplasia is associated with recurrent patellar dislocation, but it is unclear whether the dysplasia is congenital, the result of lateral tracking and chronic instability, or caused by a combination of factors. It should be considered as a component of the multifactorial patellofemoral instability and maltracking. Evidence from reported series suggests that it should be reserved for severe dysplasia in which patellofemoral stability cannot otherwise be obtained . This is a procedure that has been advocated as an adjunct to trochleoplasty in cases of severe patella dysplasia such as Wiberg type III configuration. due to the high technical demands and complication risks it is not a widely recomended procedure. Various modifications have been reported in case reports and small series  but the current evidence base is limited. Patellar instability and maltracking can be secondary to lower limb malalignment. A hypoplastic lateral femoral condyle leads to valgus angulation increasing the Q angle and the lateral pull forces on the patella. Distal femoral varus osteotomy (FVO) can be indicated for young active patients who have lateral unicompartmental osteoarthritis in a valgus knee originating in the femur. However, its indication remains controversial when associated patellofemoral osteoarthrosis is present. Zarrouk et al. conducted a retrospective study of 22 knees and concluded that the association of patellofemoral osteoarthritis does not affect the functional results. No studies exist examining the effect of varus and femoral derotation osteotomies on realignment and patellofemoral osteoarthrosis. Torsional deformities such as excessive femoral anteversion and tibial external torsion can also contribute to malalignment. Again there are very limited studies to assess the effects of de rotational osteotomies on improving maltracking as the risks associated with such major procedures make surgeons reluctant to employ them for the management of these conditions. Paulos et al. performed a cohort study of twenty five patients with dislocating patella and malalignment who were divided in two treatment groups. Group I was treated by means of a derotational high tibial osteotomy and Group II by proximal-distal realignment procedures. Group I outcomes were significantly better throughout outcome measures and the authors have suggested the simultaneous correction of ligament imbalance, excessive tubercle-sulcus angle, and lower limb torsional deformity produced significantly better results than conventional proximal-distal realignment. The surgical management of patellofemoral malalignment and instability remains a highly controversial topic in Orthopaedic Surgery as a result of encompassing a wide spectrum of pathologies around the patellofemoral joint rather than a unique clinical entity. Definitions established few decades ago are still commonly used with various modifications. The multifactorial nature of these pathologies creates further confusion and inconsistency in available literature. There is a need for defining different patient populations in order to study interventions and determine their indication. Even within these population groups it is imperative to define means by which anatomical abnormalities can be quantified. There is a large number of procedures which have been employed in the surgical management of these pathologies and they have all undergone various modifications over the course of the years. Surgical procedures may be divided into those that address the soft tissues (ligaments, muscles) and those that effect bony changes. To remedy patellar instability and maltracking, the surgeon will need to combine soft-tissue and bony procedures. As a result of the above, there is lack of strong evidence base for the majority of these procedures. The greatest proportion of studies mentioned are retrospective series in poorly defined population groups. There are significant methodological inconsistencies as to the inclusion criteria, the indications for interventions and the outcome measures employed. Saleh KJ, Arendt EA, Eldridge J, Fulkerson JP, Minas T, Mulhall KJ. Operative treatment of patellofemoral arthritis J Bone Joint Surg Am 2005; 87: 659-71. Fithian DC, Paxton EW, Stone ML, et al. Epidemiology and natural history of acute patellar dislocation Am J Sports Med 2004; 32: 1114-21. Hungerford DS, Barry MBS. Biomechanics of the patellofemoral joint Clin Orthop Relat Res 1979; 144: 9-15. Goodfellow J, Hungerford DS, Zindel M. Patellofemoral joint mechanics and pathology. Functional anatomy of the patello-femoral joint J Bone Joint Surg Br 1976; 58: 287-90. Amis AA, Faarhmand F. Biomechanics of the knee extensor mechanism Knee 1996; 3: 73-81. Mihalko WA, Boachie-Adjei Y, Spang JT, et al. Controversies and techniques in the surgical management of patellofemoral arthritis J Bone Joint Surg Am 2007; 89: 2788-802. Grelsamer RP, Weinstein CH. Applied biomechanics of the patella Clin Orthop Relat Res 2001; 389: 9-14. Senavongse W, Amis AA. The effects of articular, retinacular, or muscular deficiencies on patellofemoral joint stability: A biomechanical study in vitro J Bone Joint Surg Br 2005; 87B: 577-82. Scuderi GR, Ed. The patella. New York: Springer 1995; p. 74. Arendt EA, Fithian DC, Cohen E. Current concepts of lateral patella dislocation Clin Sports Med 2002; 21: 499-519. LaBrier K, O'Neill DB. Patellofemoral stress syndrome. Current concepts Sports Med 1993; 16: 449-59. Gomoll AH, Minas T, Farr J, Cole BJ. Treatment of chondral defects in the patellofemoral joint J Knee Surg 2006; 19(4): 285-95. Kolowich PA, Paulos LE, Rosenberg TD, et al. Lateral release of the patella: indications and contraindications Am J Sports Med 1990; 18: 359-65. Johnson LL, van Dyk GE, Green JR III, et al. Clinical assessment of asymptomatic knees: comparison of men and women Arthroscopy 1998; 14: 347-59. Fulkerson JP, Shea KP. Disorders of patellofemoral alignment J Bone Joint Surg Am 1990; 72: 1424-9. Haim A, Yaniv M, Dekel S, Amir H. Patellofemoral pain syndrome: validity of clinical and radiologic features Clin Orthop Relat Res 2006; 451: 223-8. Smith TO, Hunt NJ, Donell ST. Reliability and validity of the Q-angle: a systematic review Knee Surg Sports Traumatol Arthrosc 2008; 16(12): 1068-79. Davies AP, Costa ML, Donnell ST, Glasgow MM, Shepstone L. The sulcus angle and malalignment of the extensor mechanism of the knee J Bone Joint Surg Br 2000; 82-B: 1162-6. Heintjes EM, Berger M, Bierma-Zeinstra SMA, Bernsen RMD, Verhaar JAN, Koes BW. Pharmacotherapy for patellofemoral pain syndrome Cochrane Database Syst Rev 2004; (3): CD003470. Heintjes EM, Berger M, Bierma-Zeinstra SMA, Bernsen RMD, Verhaar JAN, Koes BW. Exercise therapy for patellofemoral pain syndrome Cochrane Database Syst Rev 2003; 4: 35. Post WR, Teitge R, Amis A. Patellofemoral malalignment: looking beyond the viewbox Clin Sports Med 2002; 21: 521-46. Dejour H, Walch G, Nove-Josserand L, et al. Factors of patellar instability: an anatomic radiographic study Knee Surg Sports Traumatol Arthrosc 1994; 2: 19-26. Hing CB, Smith TO, Donell S, Song F. Surgical versus non-surgical interventions for treating patellar dislocation Cochrane Database Syst Rev 2011; (11): CD008106. Hinton RY, Sharma KM. Acute and recurrent patellar instability in the young athlete Orthop Clin North Am 2003; 34: 385-96. Donell ST. Patellofemoral dysfunction-Extensor mechanisms malalignment Curr Orthop 2006; 20(2): 103-1. Dath R, Chakravarthy J, Porter KM. Patella dislocations Trauma 2006; 8(1): 5-11. Smith TO, Walker J, Russell N. Outcomes of medial patellofemoral ligament reconstruction for patellar instability: a systematic review Knee Surg Sports Traumatol Arthrosc 2007; 15(11): 1301-4. Donell ST, Joseph G, Hing CB, Marshall TJ. Modified Dejour trochleoplasty for severe dysplasia: operative technique and early clinical results Knee 2006; 13(4): 266-73. Hughston JC. Subluxation of the patella J Bone Joint Surg 1968; 50(A): 1003-26. Cartier P, Sanouiller JL, Grelsamer RP. Patellofemoral arthroplasty. 2-12-year follow-up study J Arthroplasty 1990; 5: 49-55. Fulkerson JP, Hungerford DS. Disorders of the patellofemoral joint. 2nd. Baltimore: Williams and Wilkins 1990; pp. 102-23. Brittberg M, Lindahl A, Nilsson A, Ohlsson C, Isaksson O, Peterson L. Treatment of deep cartilage defects in the knee with autologous chondrocyte transplantation N Engl J Med 1994; 331: 889-95. Hay GC, Kampshoff J, Kuster MS. Lateral subvastus approach with osteotomy of the tibial tubercle for total knee replacement: a two-year prospective, randomised, blinded controlled trial J Bone Joint Surg Br 2010; 92(6): 862-6. Leadbetter WB, Ragland PS, Mont MA. The appropriate use of patellofemoral arthroplasty: an analysis of reported indications, contraindications, and failures Clin Orthop 2005; 436: 91-. Merchant AC, Mercer RL. Lateral release of the patella. A preliminary report Clin Orthop Relat Res 1974; 103: 40-5. Post WR. Clinical evaluation of patients with patellofemoral disorders Arthroscopy 1999; 15: 841-51. Ficat P. The syndrome of lateral hyperpressure of the patella Acta Orthop Belg 1978; 44: 65-76. Fulkerson JP. Diagnosis and treatment of patients with patellofemoral pain Am J Sports Med 2002; 30: 447-56. Lattermann C, Toth J, Bach BR. The role of lateral retinacular release in the treatment of patellar instability Sports Med Arthrosc Rev 2007; 15(2): 57-60. Aglietti P, Pisaneschi A, De Biase P. Recurrent dislocation of patella: three kinds of surgical treatment Ital J Orthop Traumatol 1992; 18: 25-36. Dainer RD, Barrack RL, Buckley SL, et al. Arthroscopic treatment of acute patellar dislocations Arthroscopy 1988; 4: 267-71. Henry JH. Lateral retinacular release in patellofemoral subluxation: Indications, results and comparison to open patellofemoral reconstruction Am J Sports Med 1986; 14: 121-9. Gerbino PG, Zurakowski D, Soto R, Griffin E, Reig TS, Micheli LJ. Long-term functional outcome after lateral patellar retinacular release in adolescents: an observational cohort study with minimum 5-year follow-up J Pediatr Orthop 2008; 28(1): 118-23. Aderinto J, Cobb AG. Lateral release for patellofemoral arthritis Arthroscopy 2002; 18(4): 399-403. Ricchetti ET, Mehta S, Sennett BJ, Huffman GR. Comparison of lateral release versus lateral release with medial soft-tissue realignment for the treatment of recurrent patellar instability: a systematic review Arthroscopy 2007; 23(5): 463-8. Panni AS, Tartarone M, Patricola A, et al. Long-term results of lateral retinacular release Arthroscopy 2005; 21: 526-31. Lattermann C, Drake GN, Spellman J, Bach BR Jr. Lateral retinacular release for anterior knee pain: a systematic review of the literature J Knee Surg 2006; 19(4): 278-84. Verdonk P, Bonte F, Verdonk R. Lateral retinacular release Orthopade 2008; 37(9): 884-9. Gecha SR, Torg JS. Clinical prognosticators for the efficacy of retinacular release surgery to treat patellofemoral pain Clin Orthop Relat Res 1990; 253: 203-8. Pagenster G, Wolf N, Bachmann M, et al. Open lateral patellar retinacular lengthening versus open retinacular release in lateral patellar hypercompression syndrome: a prospective double-blinded comparative study on complications and outcome Arthroscopy 2012; 28(6): 788-97. Fithian DC, Paxton EW, Post WR, Panni AS. International Patellofemoral Study Group. Lateral retinacular release: a survey of the International Patellofemoral Study Group Arthroscopy 2004; 20(5): 463-8. Fithian DC, Mishra DK, Balen PF, et al. Instrumented measurement of patellar mobility Am J Spots Med 1995; 23: 607-15. Post WR. Anterior knee pain: diagnosis and treatment J Am Acad Orthop Surg 2005; 13: 534-43. Prejbeanu R, Vermesan H, Cretu O, Vermesan D. The role of patellar lateral release and augmentation of median retinaculum of patellae in treatment of femoro-patellar malalignment Rev Med Chir Soc Med Nat Iasi 2006; 110(3): 618-23. Tang GJ, Jin JC, Huang D, Ou Zx. Clinical observation of arthroscopic medial patellofemoral ligament overlap and lateral patellar retinaculum release in treatment of patellofemoral pain syndrome Zhongguo Gu Shang 2008; 21(7): 507-9. Wu C. Combined lateral retinacular release with drilling chondroplasty for treatment of patellofemoral osteoarthritis associated with patellar malalignment in elderly patients Knee 2011; 18(1): 24-9. Hughston JC. Medial subluxation of the patella as a complication of lateral retinacular release Am J Sports Med 1988; 16: 383-8. Small N. An analysis of complications in lateral retinacular release procedures Arthroscopy 1989; 5: 282. DeHaven KE. Pitfalls of the lateral retinacular release Clin Sports Med 1989; 8: 279-90. Haywarth BE, Carroll KM, Dawson CK, Gill TJ. Open lateral retinacular closure surgery for treatment of anterolateral knee pain and disability after arthroscopic lateral retinacular release Am J Sports Med 2012; 40(2): 376-82. Teitge RA, Torga Spak R. Lateral patellofemoral ligament reconstruction Arthroscopy 2004; 20(9): 998-1002. Woods GW, Elkousy HA, O'Connor DP. Arthroscopic release of the vastus lateralis tendon for recurrent patellar dislocation Am J Sports Med 2006; 34: 824-31. Pawar U, Rao KN, Sundaram PS, Thilak J, Varghese J. Scintigraphic assessment of patellar viability in total knee arthroplasty after lateral release J Arthroplasty 2009; 24(4): 636-40. O'Neill DB. Open lateral retinacular lengthening compared with arthroscopic release. A prospective, randomized outcome study J Bone Joint Surg Br 1997; 79: 1759-69. Metcalf RW. An arthroscopic method for lateral release of subluxating or dislocating patella Clin Orthop Relat Res 1982; 167: 9-18. Simpson LA, Barrett JP Jr. Factors associated with poor results following arthroscopic subcutaneous lateral retinacular release Clin Orthop Relat Res 1984; 186: 165-71. Bigos SJ, McBride GG. The isolated lateral retinacular release in the treatment of patellofemoral disorders Clin Orthop Relat Res 1984; 186: 75-80. Chen SC, Ramanathan EB. The treatment of patellar instability by lateral release J Bone Joint Surg Br 1984; 66: 344-8. Ogilvie-Harris DJ, Jackson RW. The arthroscopic treatment of chondromalacia patellae J Bone Joint Surg Br 1984; 66: 660-5. Dzioba RB. Diagnostic arthroscopy and longitudinal open lateral release. A four year follow-up study to determine predictors of surgical outcome Am J Sports Med 1990; 18: 343-8. Scott MS. Arthroscopic lateral retinacular release: an extensive evaluation. USA: Presented at the AOSSM Meeting New Orleans 1986. Henry JE, Pflum FA Jr. Arthroscopic proximal patella realignment and stabilization Arthroscopy 1995; 11: 424-5. Schonholtz GJ, Zahn MG, Magee CM. Lateral retinacular release of the patella Arthroscopy 1987; 3: 269-. Sherman OH, Fox JM, Sperling H, et al. Patellar instability: treatment by arthroscopic electrosurgical lateral release Arthroscopy 1987; 3: 152-60. Dandy DJ, Desai SS. The results of arthroscopic lateral release of the extensor mechanism for recurrent dislocation of the patella after 8 years Arthroscopy 1994; 10: 540-. Arendt EA. MPFL reconstruction for PF instability. The soft (tissue) approach Rev Chir Orthop Traumatol 2009; 95(8): 371-74. Davis DK, Fithian DC. Techniques of medial retinacular repair and reconstruction Clin Orthop Relat Res 2002; 402: 38-52. Desio S, Burks RT, Bachus K. Soft tissue restraints to lateral patella translation Am J Sports Med 1998; 26: 59-65. Conlan T, Garth WP, Lemons J. Evaluation of the medial soft tissue restraints of the extensor mechanism of the knee J Bone Joint Surg Am 1993; 75(A): 682-93. Sallay PI, Poggi J, Speer KP, Garrett WE. Acute dislocation of the patella. A correlative pathoanatomic study Am J Sports Med 1996; 24(1): 52-60. Fulkerson JP. Patellofemoral pain disorders: evaluation and management J Am Acad Orthop Surg 1994; 2: 124-32. Dandy DJ, Griffiths D. Lateral release for recurrent dislocation of the patella J Bone Joint Surg Br 1989; 71: 121-5. Satterfield WH, Johnson DL. Arthroscopic patellar “bankart” repair after acute dislocation Arthroscopy 2005; 21: 627. Schottle PB, Fucentese SF, Romero J. Clinical and radiological outcome of medial patellofemoral ligament reconstruction with a semitendinosus autograft for patella instability Knee Surg Sports Traumatol Arthrosc 2005; 13: 516-21. Noyes FR, Albright JC. Reconstruction of the medial patellofemoral ligament with autologous quadriceps tendon Arthroscopy 2006; 22: 904. Krause F, Kolling C, Brantschen R, et al. Medium-term results after m. vastus medialis obliquus-plasty for lateral patellar dislocation Orthopade 2006; 35: 94-101. Schock EJ, Burks RT. Medial patellofemoral ligament reconstruction using a hamstring graft Oper Tech Sports Med 2001; 9: 169-75. Burks RT, Luker MG. Medial patellofemoral ligament reconstruction Tech Orthop 1997; 12: 185-91. Chassaing V, Tremoulet J. Medial patellofemoral ligament reconstruction with gracilis autograft for patellar instability Rev Chir Orthop Reparatrice Appar Mot 2005; 9194: 335-40. Nomura E, Inoue M, Suqiura H. Ultrastructural study of the extra-articular Leeds-Keio ligament prosthesis J Clin Pathol 2005; 58: 665-6. LeGrand AB, Greis PE, Dobbs RE, Burks RT. MPFL reconstruction Sports Med Arthrosc 2007; 15(2): 72-. Schottle PB, Sandro FF, Pfirrman C, et al. Trochleaplasty for patellar instability due to trochlear dysplasia: a minimum of 2-year clinical and radiological follow-up of 19 knees Acta Orthop 2005; 76: 693-8. Steiner TM, Torga-Spak R, Teitge R. Medial patellofemoral ligament reconstruction in patients with lateral patellar instability and trochlear dysplasia Am J Sports Med 2006; 34: 1254-61. Ostermeier S, Stukenborg-Colsman C, Hurschler C. In vitro investigation of the effect of medial patellofemoral ligament reconstruction and medial tibial tuberosity transfer on lateral patellar stability Arthroscopy 2006; 22: 308-19. Deie M, Ochi M, Sumen Y, et al. A long-term follow-up study after medial patellofemoral ligament reconstruction using the transferred semitendinosus tendon for patellar instability Knee Surg Sports Traumatol Arthrosc 2005; 13: 522-8. Fernandez E, Sala D, Castejon M. Reconstruction of the medial patellofemoral ligament for patellar instability using a semitendinosus autograft Acta Orthop Belg 2005; 71: 303-8. Nomura E, Motoyasu I. Hybrid medial patellofemoral ligament reconstruction using the semitendinous tendon for recurrent patellar dislocation: minimum 3 year's follow-up Arthroscopy 2006; 22: 787-93. Drez D, Edwards TB, Williams CS. Results of medial patellofemoral ligament reconstruction in the treatment of patellar dislocation Arthroscopy 2001; 17: 298-306. Gomes JLE, Marczyk LRS, Cesar de Cesar P, et al. Medial patellofemoral ligament reconstruction with semitendinosus autograft for chronic patella instability: a follow-up study Arthroscopy 2004; 20: 147-51. Xu H, Zhang C, Pei G, Zhu Q, Han Y. Arthroscopic medial retinacular imbrication for the treatment of recurrent patellar instability: a simple and all-inside technique Orthopaedics 2011; 34(7): 524-9. Tom A, Fulkerson JP. Restoration of native medial patellofemoral ligament support after patella dislocation Sports Med Arthrosc 2007; 15(2): 68-71. Yan C, Chen B, Zhang J, Zhao B, Liu H. Treatment of patellar instability of adolescence through arthroscopic reconstruction of medial patellofemoral ligament with trabs of medial soft tissues Zhongguo Xiu Fu Chong Jian Wai Ke Za Zhi 2009; 23(9): 1038-41. Zhao J, Huangfu X, He Y, Liu W. Recurrent patellar dislocation in adolescents: medial retinaculum plication versus vastus medialis plasty Am J Sports Med 2012; 40(1): 123-32. Xu C, Zhao J. Treatment of recurrent patellar dislocation with arthroscopic medial retinaculum plication in adolescents Zhongguo Xiu Fu Chong Jian Wai Ke Za Zhi 2011; 25(8): 931-6. Wang F, Kang HJ, Chen BC, Chen W, Su YL, Zhang YZ. Combination of medial patellofemoral ligament reconstruction with vastus medialis advancement for chronic patellar dislocation Chin Med J (Engl) 2010; 123(21): 3024-9. Zeichen J, Lobenhoffer P, Bosch U, Friedemann K, Tscherne H. Interim results of surgical therapy of patellar dislocation by Insall proximal reconstruction Unfallchirur 1998; 101(6): 446-53. Bollier M, Fulkerson J, Cosgarea A, Tanaka M. Technical failure of medial patellofemoral ligament reconstruction Arthroscopy 2011; 27(8): 1153-9. Fischer B, Nyland J, Brand E, Curtin B. Medial patellofemoral ligament reconstruction for recurrent patellar dislocation: a systematic review including rehabilitation and return-to-sports efficacy Arthroscopy 2010; 26(10): 1384-94. Trillat ADH, Couette A. Diagnostic et traitement des subluxations récidivantes de la rotule Rev Chir Orthop Reparatrice Appar Mot 1964; 50: 813-24. Maquet P. Advancement of the tibial tuberosity Clin Orthop Relat Res 1976; 225-30. Fulkerson JP. Anteromedialization of the tibial tuberosity for patellofemoral malalignment Clin Orthop Relat Res 1983; 177: 176-81. Morshuis WJ, Pavlov PW, DeRooy KP. Anteromedialization of the tibial tuberosity in the treatment of patellofemoral pain and malalignment Clin Orthop Relat Res 1990; 250: 42. Boden BP, Pearsall AW, Garrett WE Jr, Feagin JA Jr. Patellofemoral instability: evaluation and management J Am Acad Orthop Surg 1997; 5(1): 47-57. Hauser ED. Total tendon transplant for slipping patella. A new operation for recurrent dislocation of the patella1938 Clin Orthop Relat Res 2006; 452: 7-16. Marcacci M, Zaffagnini S, Iacono F, et al. Results in the treatment of recurrent dislocation of the patella after 30 years' follow-up Knee Surg Sports Traumatol Arthrosc 1995; 3: 163-6. Radin EL, Pan HQ. Long-term follow-up study on the Maquet procedure with special reference to the causes of failure Clin Orthop Relat Res 1993; (290): 253-8. Cox JS. An evaluation of the Elmslie-Trillat procedure for management of patellar dislocations and subluxations: a preliminary report Am J Sports Med 1976; 4(2): 72-. Endres S, Wilke A. A 10 year follow-up study after Roux-Elmslie- Trillat treatment for cases of patellar instability BMC Musculoskelet Disord 2011; 12: 48. Nakajima A, Watanabe H, Rokkaku T, Koda M, Yamada T, Murakami M. The Elmslie-Trillat procedure for recurrent patellar subluxation after total knee arthroplasty J Arthroplasty 2010; 25 (7): 1170. Whiteside LA. Distal realignment of the patellar tendon to correct abnormal patellar tracking Clin Orthop Relat Res 1997; (344): 284-9. Dannawi Z, Khanduja V, Palmer CR, El-Zebdeh M. Evaluation of the modified Elmslie-Trillat procedure for patellofemoral dysfunction Orthopedics 2010; 33(1): 13. Kumar A, Jones S, Bickerstaff DR, Smith TW. Functional evaluation of the modified Elmslie-Trillat procedure for patello-femoral dysfunction Knee 2001; 8(4): 287-92. Karataglis D, Green MA, Learmonth DJ. Functional outcome following modified Elmslie-Trillat procedure Knee 2006; 13(6): 464-8. Naranja RJ Jr, Reilly PJ, Kuhlman JR, Haut E, Torg JS. Long-term evaluation of the Elmslie-Trillat-Maquet procedure for patellofemoral dysfunction Am J Sports Med 1996; 24(6): 779-84. Carney JR, Mologne TS, Muldoon M, Cox JS. Long-term evaluation of the Roux-Elmslie-Trillat procedure for patellar instability: a 26-year follow-up Am J Sports Med 2005; 33(8): 1220-3. Nakagawa K, Wada Y, Minamide M, Tsuchiya A, Moriya H. Deterioration of long-term clinical results after the Elmslie-Trillat procedure for dislocation of the patella J Bone Joint Surg Br 2002; 84(6): 861-4. Barber FA, McGarry JE. Elmslie-Trillat procedure for the treatment of recurrent patellar instability Arthroscopy 2008; 24 (1): 77-81. Rillmann P, Oswald A, Holzach P, Ryf C. Fulkerson's modified Elmslie-Trillat procedure for objective patellar instability and patellofemoral pain syndrome Swiss Surg 2000; 6(6): 328-4. Palmer SH, Servant CT, Maguire J, Machan SBE, Parish EN, Cross MJ. surgical reconstruction of severe patellofemoral maltracking Clin Orthop Relat Res 2004; 419: 144-8. Post WR, Fulkerson JP. Distal realignment of the patellofemoral joint. Indications, effects, results, and recommendations Orthop Clin North Am 1992; 23(4): 631-43. Karamehmetoğlu M, Oztürkmen Y, Azboy I, Caniklioğlu M. Fulkerson osteotomy for the treatment of chronic patellofemoral malalignment Acta Orthop Traumatol Turc 2007; 41(1): 21-30. Wang CJ. Management of patellofemoral arthrosis in middle-aged patients Chang Gung Med J 2001; 24(11): 672-80. Price M, Malkani AL, Baker D. Fulkerson procedure for chronic patella component dislocation after total knee arthroplasty J Arthroplasty 2009; 24(6): 914-7. Preston CF, Fulkerson EW, Meislin R, Di Cesare PE. Osteotomy about the knee: applications, techniques, and re-sults J Knee Surg 2005; 18: 258-72. Ramappa AJ, Apreleva M, Harrold FR, et al. The effects of medialization and anteromedialization of the tibial tubercle on patellofemoral mechanics and kinematics Am J Sports Med 2006; 34: 749-56. Lim AK, Chang HC, Hui JH. Recurrent patellar dislocation: reappraising our approach to surgery Ann Acad Med Singap 2008; 37(4): 320-. Koëter S, Diks MJ, Anderson PG, Wymenga AB. A modified tibial tubercle osteotomy for patellar maltracking: results at two years J Bone Joint Surg Br 2007; 89(2): 180-5. Marcacci M, Zaffagnini S, Presti ML, et al. Treatment of chronic patellar dislocation with a modified Elmslie-Trillat Procedure Arch Orthop Trauma Surg 2004; 124: 250-7. Diks MJF, Wymenga AB, Anderson PG. Patients with lateral tracking patella have better pain relief following CT-guided tuberosity transfer than patients with unstable patella Knee Surg Sports Traumatol Arthrosc 2003; 11: 384-8. AL-Sayyad MJ, Cameron JC. Functional outcome after tibial tubercle transfer for the painful patella alta Clin Orthop Relat Res 2002; (396): 152-62. Caton JH, Dejour D. Tibial tubercle osteotomy in patello-femoral instability and in patellar height abnormality Int Orthop 2010; 34(2): 305-9. Servien E, Ait Si Selmi T, Neyret P. Study of the patellar apex in objective patellar dislocation Rev Chir Orthop Reparatrice Appar Mot 2003; 89: 605-12. Albee F. The bone graft wedge in the treatment of habitual dislocation of the patella Med Rec 1915; 88: 257-9. Masse Y. Trochleoplasty. Restoration of the intercondylar groove in subluxations and dislocations of the patella Rev Chir Orthop Reparatrice Appar Mot 1978; 64: 3-17. Dejour H, Walch G, Neyret Ph, Adeleine P. Dysplasia of the femoral trochlea Rev Chir Orthop Reparatrice Appar Mot 1990; 76: 45-54. Lippacher S, Dejour D, Elsharkawi M, et al. Observer agreement on the dejour trochlear dysplasia classification: a comparison of true lateral radiographs and axial magnetic resonance images Am J Sports Med 2012; 40(4): 837-43. Koch PP, Fuchs B, Meyer DC, Fucentese SF. Closing wedge patellar osteotomy in combination with trochleoplasty Acta Orthop Belg 2011; 77(1): 116-21. Thaunat M, Bessiere C, Pujol N, Boisrenoult P, Beaufils P. Recession wedge trochleoplasty as an additional procedure in the surgical treatment of patellar instability with major trochlear dysplasia: early results Orthop Traumatol Surg Re 201; 97(8): 833-45. Blønd L, Schöttle PB. The arthroscopic deepening trochleoplasty Knee Surg Sports Traumatol Arthrosc 2010; 18(4): 480-5. Smith TO, Davies L. Outcomes following trochleoplasty for patellar instability with trochlear dysplasia: a systematic review Eur J Orthop Surg Traumatol 2008; 18(6): 425-33. Dejour D, Saggin P. The sulcus deepening trochleoplasty-the Lyon's procedure Int Orthop 2010; 34(2): 311-6. Bollier M, Fulkerson JP. The role of trochlear dysplasia in patellofemoral instability J Am Acad Orthop Surg 2011; 19(1): 8-16. Zarrouk A, Bouzidi R, Karray B, Kammoun S, Mourali S, Kooli M. Distal femoral varus osteotomy outcome: Is associated femoropatellar osteoarthritis consequential? Orthop Traumatol Surg Res 2010; 96(6): 632-. Paulos L, Swanson SC, Stoddard GJ, Barber-Westin S. Surgical correction of limb malalignment for instability of the patella: a comparison of 2 techniques Am J Sports Med 2009; 37(7): 1288-300.